One of the biggest challenges of breaking into the field of digital analytics is that the landscape of digital marketing is extremely complex. It’s a hard task finding professionals who know the best of both worlds – digital marketing and data science. There is a serious shortage in the supply of adequate talent, while spending on digital marketing continues to rise unabated. I have seen positions open for years in the digital analytics space because of the shortage of such niche talent coupled with the immense growth of this field. Over the last few months, I have spent some time trying to understand the digital marketing landscape and how it integrates with our field of data science. In this article, I have shared my compiled notes that should simplify this complex world of digital marketing and help you understand how you can use your data science tools in this terrain. Excited yet? Good. Let’s start with the most basic question and take it from there! What makes Digital Media better than Traditional Media? As a Digital Analytics Professional, why should I even care about Digital Media? How does Google choose ads for every search and their Placements? 1. Once printed or aired, an advertisement cannot be changed. 2. High time to market. This is actually a big challenge for any dynamic industry. A lot of offers require a quick response time (like Amazon Prime sales) and advertisers don’t wish to announce the sale beforehand to make sure customers regularly come to their website to check out offers. 3. No way to accurately measure viewed ads. All we know is the response from ad campaigns. 4. Limited ways to reach out to a specific audience. 5. Even if we manage to reach the right customers, we might not really reach out at the right time. For instance, if we advertise during specific TV shows that are viewed by our target audience, we don’t really know whether the target customer is looking at the TV at the time when our ad is being played. Similarly, if we send a mail to a specific prospect who is traveling at the time, it’s a lost opportunity. 6. Given a low response from these channels, most of these traditional methods have a high cost per acquisition. Digital marketing is able to overcome all the challenges mentioned above.”How” will become clearer as we cover other related topics in this article. 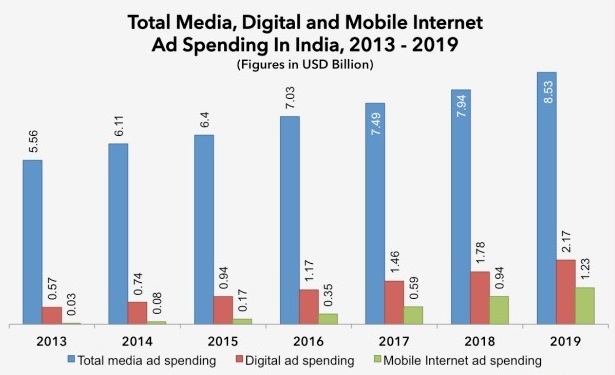 With internet penetration reaching 60%+ around the globe and rapidly increasing (see chart below), digital media is now an ideal place to catch your audience’s attention. Today, we can reach out to 4 billion+ internet users through digital media. Another survey (below) indicates 2 hr. 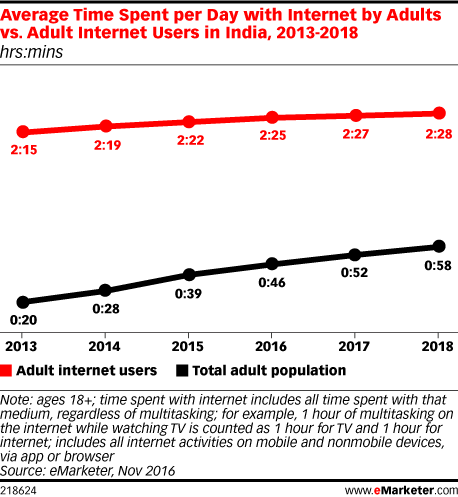 28 mins spent per day by adult internet users in India. Noting that average time spent by the total adult population is 1 hour, total internet user average should be somewhere between 1 hr to 2.5 hrs (say, 2 hours). An estimate of the ad opportunity available per day on the internet is 4 Bn*2 hours = 8 Bn hours/day. Even if we assume only 1% of this internet time can be monetized with ads, we are still talking about 80 Million hours/day! This exercise would have given you a sense of the magnitude of opportunity in digital marketing. And as an analyst, you would have definitely noticed the incremental curve for both internet users and the average time spent on the internet. Given the scale and precision of this channel, digital media presents multiple methods for advertising. Let’s broadly classify these sub-channels of digital media. A data scientist can contribute literally in any domain and any industry. For instance, there are data science roles in creating new medicine, intelligent voice assistants like Google Home, targeting strategy, etc. For each of these roles, a data scientist might need minimal knowledge of the domain, but can still make strong contributions with the tools we have. For instance, to contribute towards building a new medicine, you need not know all the biology behind it. All you need to know is an objective function and the parameters you need to optimize. In these scenarios, you can easily break down the work into what the business person needs to tell and what you need to know already. How to best capture this data for accuracy? How to use the tool(s) you have created with data science? 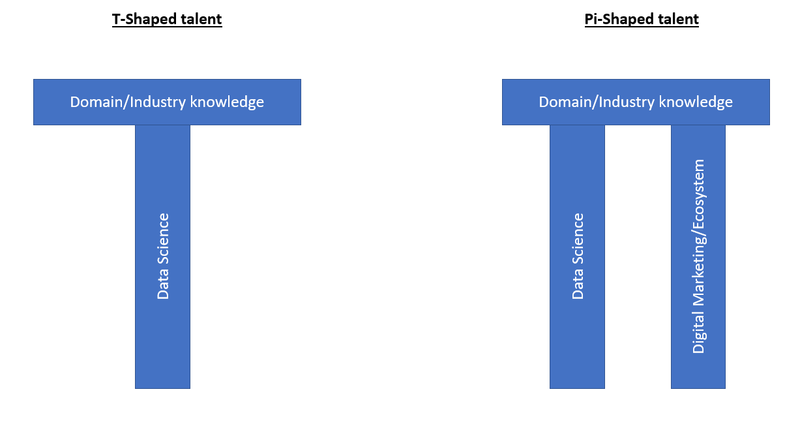 The T-shaped talent suffices for most data scientist roles in different domains. However, digital analytics professionals need the Pi-shaped talent to be a rockstar. If you already understand the world of data science, then this article will help you grasp the second aspect of the Pi-shaped talent requirement, the digital ecosystem, and open up a land of opportunities for you. In no way does this article capture everything under the digital marketing umbrella, but this is as good a place as any to get your journey started. Data science has a strong application in each of these 3 types of media. Before we get into the actual applications of data science, let’s first broadly break down the journey of a prospect into stages. There are three journeys involved in customer acquisition. Our end objective of a successful campaign is to show ads to only those prospect that have a strong propensity of being a profitable customer. 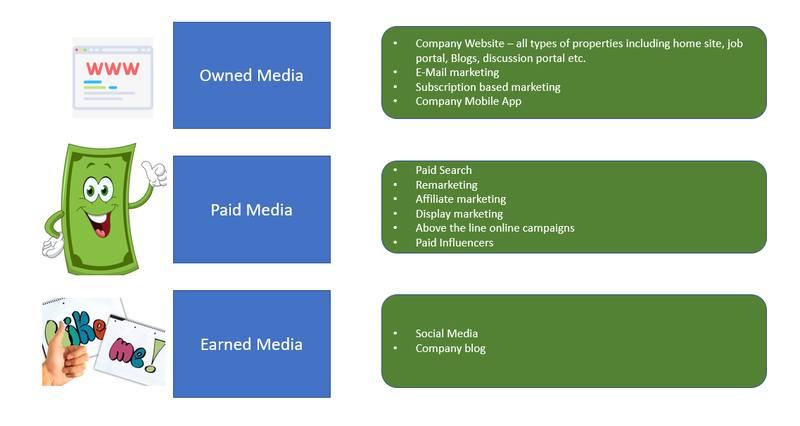 The ad exposure journey is normally managed by digital media/ad serving companies like Google, Facebook, etc. Finally, the customer journey is managed by your in-house analytics team as this is highly confidential company information. As you might have guessed, it becomes very difficult to collaborate between all the three stages to reach ensure a successful campaign. Let’s look at a a real-life scenario that will make this challenge a lot more clearer. Now, here is the challenge. To stay compliant with the regulatory authority, you cannot deny a policy just because of profitability reasons. Hence, the only way you can craft your acquisition portfolio is if you can control who is looking at your ads. For a simplistic view, let’s say 50% of your acquisition comes from your website directly and the remaining comes through Google’s Paid Search. Acquisition coming directly to your site is hard to control as these prospects are already down the conversion funnel. So you see the challenge – the variable that is available for real-time targeting by ad server companies is not available with you to link profitability. Similarly, companies cannot make their profitability linked information available to Google to do specific targeting. Even though such direct targeting is difficult with paid media, we still have a lot of ways to get around this challenge. We will talk more about these targeting audience methods later in this article. Before we move on to targeting audience methods on digital media, let’s get some jargon out of the way. The best way to understand these jargon terms is to put them in contrast against each other. When a common person thinks about Google, we think about the Search Engine (well, at least I do!). When we search for a keyword, we see a list of links. Advertisers have to pay for sponsored ads that appear at the top of the rankings. The list of links that come in organic search are free of cost and the rank is determined by Google’s proprietary Page Rank algorithm. 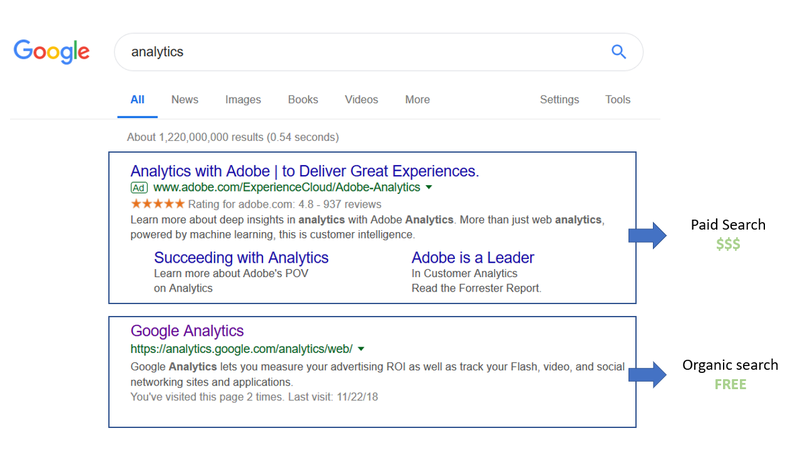 In the picture below, Adobe has paid for the sponsored ad, whereas the Google Analytics link below it is an organic search. What about Google Display Network (GDN)? In addition to the search network, Google also partners with 2 million sites that can publish ad banners on their site. GDN has a huge coverage of about 90% internet users. The biggest challenge with GDN is the low response rate because these visitors are not really looking out for your product. These visitors are simply looking at news, or the weather or are watching a video, etc. You should now have an understanding of Google’s core business of advertising. This is the majority revenue generator for Google. Every company wants to partner with Google to advertise their product/service. But how does Google choose which ads have to be displayed and when? 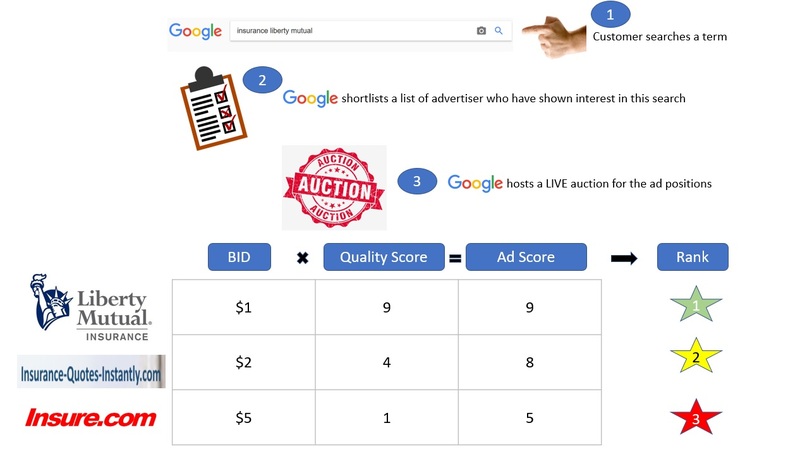 Let’s review the Google Ad auction briefly before we jump to the digital marketing jargon. You’ll be amazed to know how Google does this. Let’s try to understand the logic through an illustrative example. 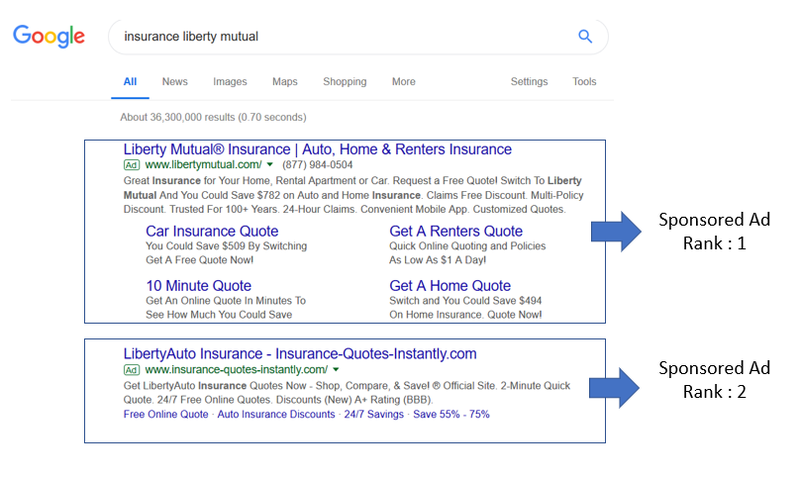 As you can see, “insurance-quote-instantly” also participated in this auction but did not win against liberty mutual. So how does Google bring in this dimension of relevancy to remove monetary bias? Google has a concept of quality score for each rank which is kind of a page rank score on organic search. This quality score is then multiplied by the bid to calculate the ad score. This ad score is finally used to rank order the ads for a search instance. You don’t need to always bid very high to win an ad rank auction. For instances where people are searching for you specifically, you will win the bid with minimal cost. CPC vs CPM bidding – Quick note of the types of bidding we do on both search and display networks. CPC bidding is when the advertiser wants to bid on how much they are willing to pay for a click. CPM bidding is based on per 1000 impressions. It really depends on the type of objective an advertiser is looking to achieve. If the objective of the advertiser is branding, all that matters is impressions. However, if the advertiser wants customers to progress in the conversion funnel, they will generally bid on CPC. One exception here are multi-view purchases, where a customer generally takes a decision after looking at an ad many times. In such cases, the advertiser might bid on CPM even when the objective is conversion. What levers do Publishers have to subset in the pool bidding for their ad space? Exclusion of specific category ads: For instance, a baby blog might not really like ads from dating sites. These categories are generally very sensitive, like political views, adult content, etc. What levers do Advertisers have to subset in the pool bidding for their ad space? We will cover this topic in our section on Google Analytics later. For now, just note that you have levers on Demographic and Behavioral attributes you can use to target ad inventory. Further, you can choose keywords to make a precise selection of the auction you wish to participate in. DoubleClick is an ad-serving company that was bought by Google for $3.1 billion in 2008. In simple words, DoubleClick for Publishers makes it easier for publishers to monitize their content. It also provides effective tracking of how your content is performing in context of advertisements. DoubleClick for Advertisers, on the other hand, helps advertisers optimize their Search and Display campaigns. Google recently rebranded DFP as Google Ad Manager. DFP comes out much stronger than AdSense when you wish to manage your ads beyond Google Display Network – including Affiliated Brands, Real-time Ad exchanges, etc. 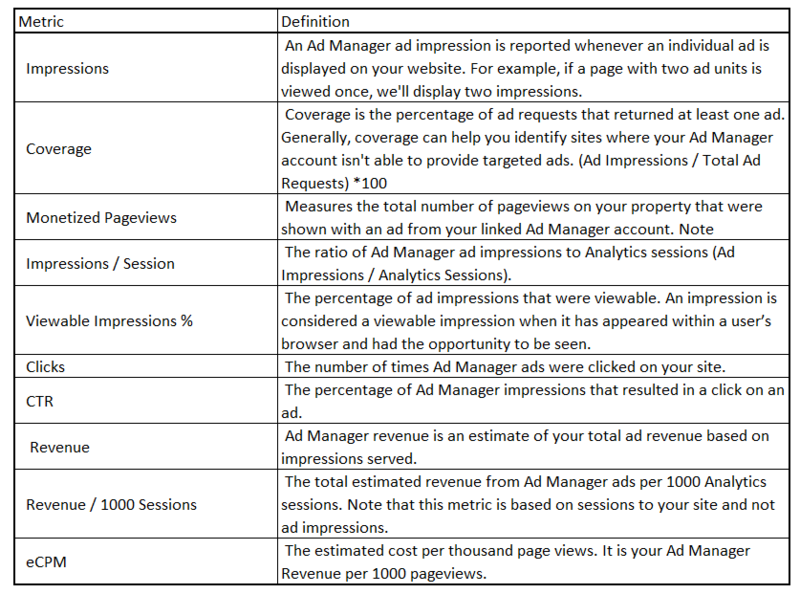 Let’s see a few examples of how we analysts use the ad tracking done by DFP. 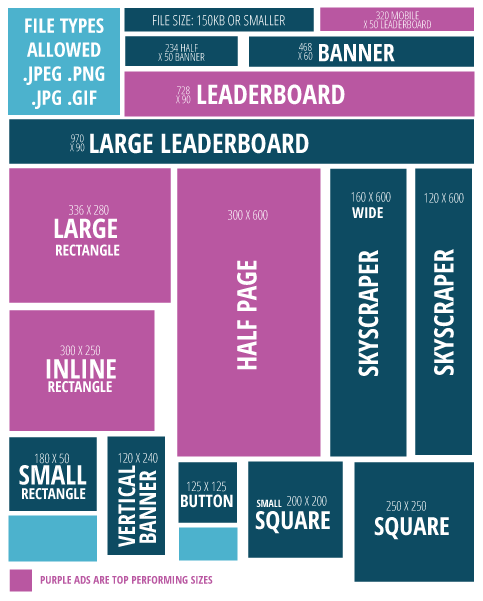 These dimensions are just examples of dimensions available to you for slicing and dicing information. Let’s take a look at a dimension metric view to learn more. Leaderboard (LB) has the maximum number of impressions, which makes sense as it comes on the top and should appear during most visits. Skyscraper has a low CTR and revenue per 1000 impressions, indicating these banners might not be completely visible (definitely scope of improvement there). We can further deep dive into this analysis with DoubleClick for effective targeting, but we’ll keep that for a future article. DoubleClick Search is primarily used by advertisers to manage their ads on multiple Search Engines, including Google Search Network. 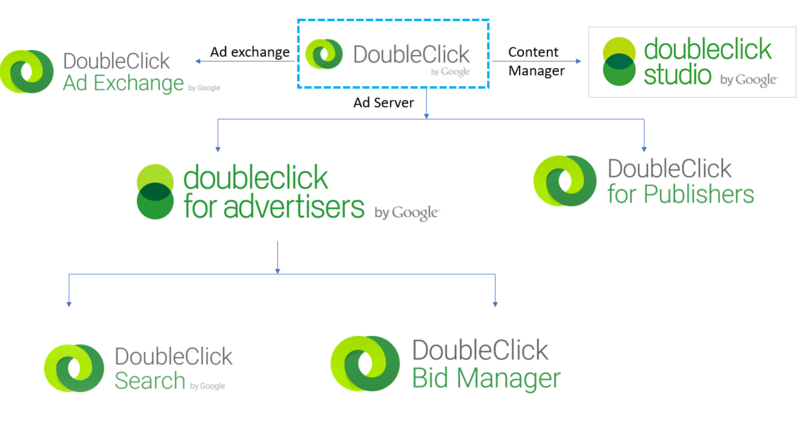 DoubleClick Bid Manager is used to manage Display Ads across the Google Display Network and Real-Time Bidding platforms. DoubleClick Ad Exchange is like the New York Stock Exchange where ad inventory is bought and sold. DoubleClick also provides campaign management services like DoubleClick Studio. Services like DoubleClick, LiveRamp, etc. place a 3rd party cookie that they use to track user activity across the web space. An important thing to note here is that you can only read those cookies that you have placed, because all cookies have unique properties. For example, Amazon cannot read a cookie that Wells Fargo has placed in a visitor’s browser. Tag containers can contain multiple pixels or tags. One tag can trigger another set of tags and so on. Hence, containers are used to make conditional decisions that can determine if a set of pixels should fire or not. 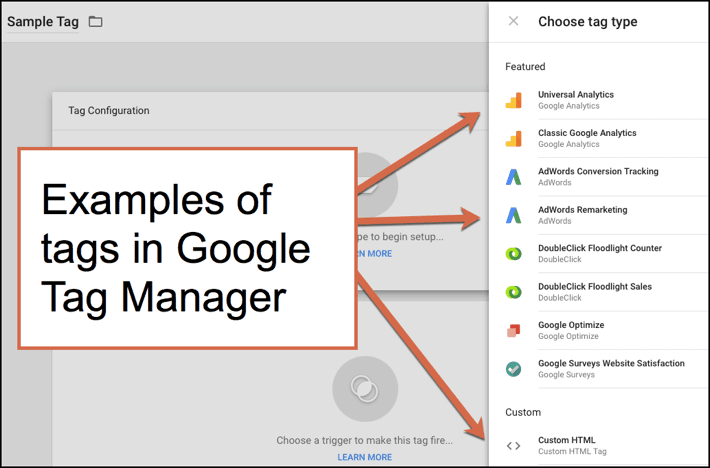 Google Tag Manager (GTM): By now, you would have realized that the digital world is all about maintaining these tags. Why? So you can measure campaigns and create new audiences for prospecting. Here is a simple example – Tom runs a food blog. He actively markets on paid search using Adwords. He also re-markets his customer to return to his blog if the customer has not come back for some time. He additionally tracks his online traffic using Google Analytics. He even leverages DoubleClick to target display ads beyond Google Network. Imagine the number of tags Tom might have to put on his site – one for Adwords, one for re-marketing, one for DoubleClick floodlight and some custom DMP/DSP tags for specific re-marketing campaigns. Data layer is another key concept you should know. This component is what makes Google Tag Manager such a powerful tool. Simply put, you can think of it as a bridge for data between your site and GTM. GTM can do a two-way communication with the data layer. GTM will then make this data available for all the tags sitting in it. Quick note on Floodlight tags: DoubleClick uses floodlight tags to note visitor activities and sales. They provide two types of tags – FL Counter and FL Sales. FL Counter is primarily used to link some conversion to ad exposure. Hence, it is used to track subscriptions after an ad click from a visitor. FL Sales is primarily to store transactions with a dollar value. 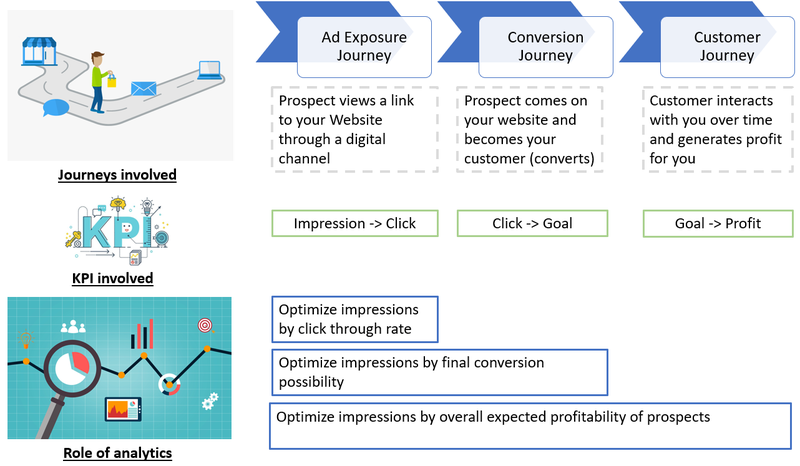 It can help you optimize your campaign on total ad spends instead of maximizing conversions. I must confess this is the most confusing and difficult aspect of digital marketing. Feel free to skip this section if it becomes too complex. I will try my best to make these concepts as simple as possible. All these terms are related to technologies used primarily in display media. So before getting into these technologies, let’s first try to understand the display media ecosystem. Victor runs a very popular travel blog. He gets about a million visits a month. He now wants to monetize his blog by putting an ad banner at the bottom of the article in the square placement. Out of the million visits, 500k visits will be on blogs that are related to hotel stays and the remaining 500k visits on blogs related to other topics. Victor wants the hotel blogs to specifically have Hotel related ads. He leverages various ad selling options to sell all his ad spaces. As you can clearly see from the diagram, Direct Buy is done without any trading involved. Programmatic Guaranteed Selling is through DSP to the Publisher. If the inventory is unsold in these two options, it will be made available as Preferred Ads buyer, before it goes into the pool of Ads Exchange. Finally, we go through the private auction and RTB stages respectively. Google DoubleClick Bid Manager is a Demand Side platform. 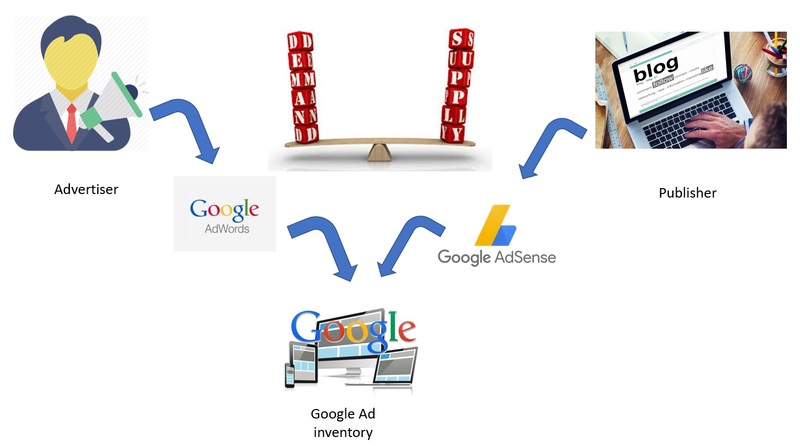 However, Adwords is not truly a Demand Side platform because of multiple reasons – it restricts the ad inventory to only the Google Display Network. 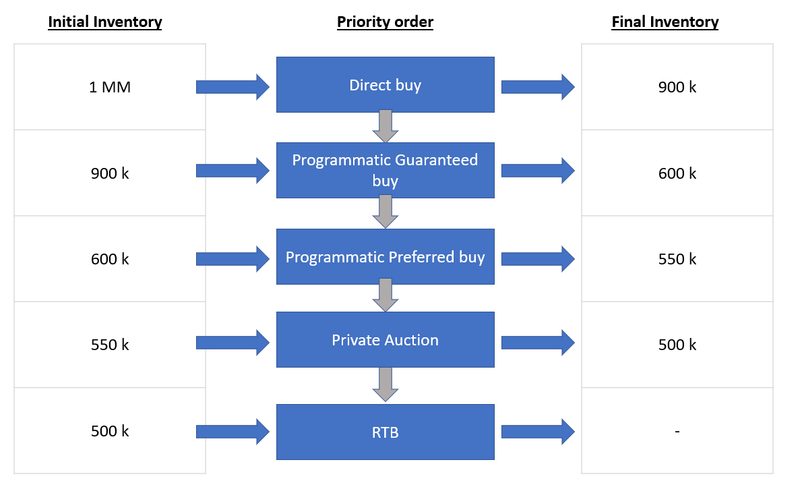 There is no option for programmatic Direct Buy or private auctions. Data Management Platform is at the heart of analytics for Display Marketing. Let’s try to understand it with an example. First, a quick concept – Remarketing is a way to win back a prospect who has visited your website but has not made an immediate purchase or enquiry. You might have witnessed Amazon ads following you on the web – that’s remarketing. The remarketing ad will be an offer of 5% off on this Laptop A. XYZ wants to publish these ads by placing bids on Ad Exchanges. How can XYZ execute such complex targeting? Short Answer – through a Data Management Platform (DMP). If you want to know the technical details of how this can be done, continue reading this section. Otherwise, all you need to know is that DMP can make specific targeting possible. DMP also provides third-party data, like preferences, interests, etc. You can skip the rest of this section if you want to ignore the technical details. This is the concept that fascinated and scared me the most. 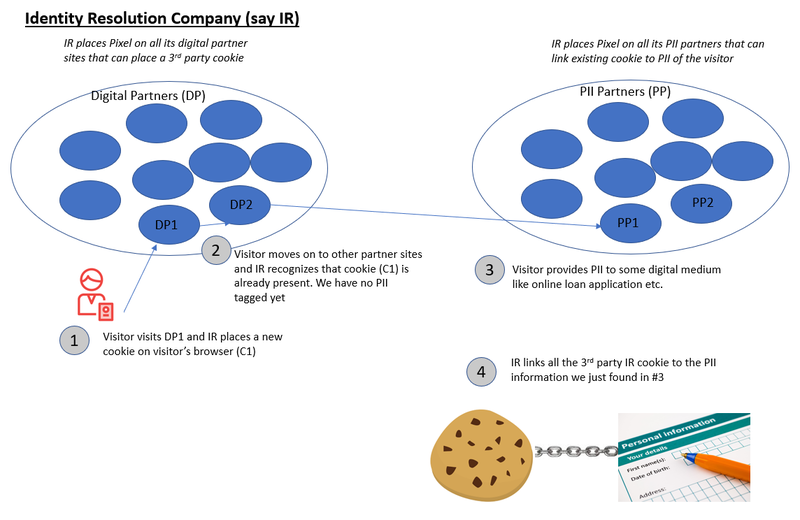 We already know that the entire web world is tracking visitors through cookies. Cookies have been around for a long time. Using cookie DoubleClick can really stitch a persona – for instance, a visitor that reads AV blogs clicks on an online analytics course, but does not convert. The same visitor comes back to another university analytics course and as he/she was tagged as an analytics enthusiast, this new university gave him/her a discount of 20% on the course through on-site optimization. The visitor finally converts and complets the course in 60 days. And so on…. So, essentially we know everything about the visitor. What’s left? A very key information, which is, “This visitor is John Bell”. What is so important about this new information? This is a Personal Identification Information (PII) and will never change over time. Cookies get deleted all the time. But if we can link these cookies to PII, we not only have a persona that can describe a small subset of the population, but we directly have an individual that only describes one person on the planet. Both the tools have their pros and cons. If you are a small scale company, choosing Google Analytics is a no-brainer. 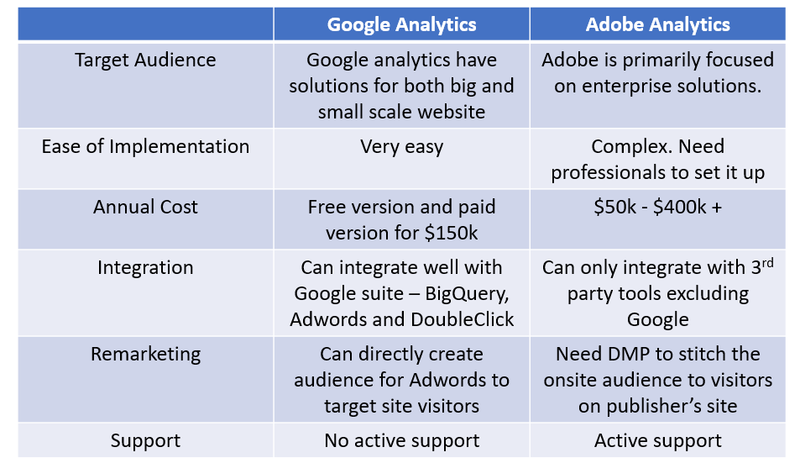 Even if you are a large corporate, the choice is tricky because Adobe on one hand gives active support, but Google integrates seamlessly with well-managed ad inventory. Note that Adobe can also integrate third-party tools for ad targeting, but not all of them are well-managed and might be prone to bot attacks, thus wasting your ad spends. You might have realized that each concept we covered in this guide is closely linked with each other. A comprehensive view is very important to appreciate the entire digital ecosystem. Trust me, it was impossible to find all this information in one place. As a data scientist, we do the hard part of learning all these concepts on the job. So I decided to put everything in one place with the aim of helping any future analyst get up to speed really quickly and keep up with the pace of this dynamically evolving industry. With the knowledge provided in this article, you will not only understand how to build a successful digital analytics driven strategy, but will also start appreciating how your strategy fits into the broader world of digital marketing. This combination of knowledge is extremely rare in the industry because most professionals focus on only one of these aspects. What it takes to create a successful marketing campaign on digital media lies at the intersection of the digital ecosystem, marketing and analytics. Thanks Hena – Please do share your experience and expertise through your comments. Well written article. Clears all concepts. All enjoy reading your articles Tavish. Thanks a lot. Could you suggest any book to approach this field? I will prefer an online course more than a book as these concepts are difficult to grasp without proper animations and hands on exercises. Wharton has an online course on digital marketing which can be helpful. You will also find a good course on Coursera from University of Illinois. Hey Tavish, article is made us think out of box, thanks for great work. People looking for book so i think its time to write a book for them . Impressive！very informative. Thanks for the article.